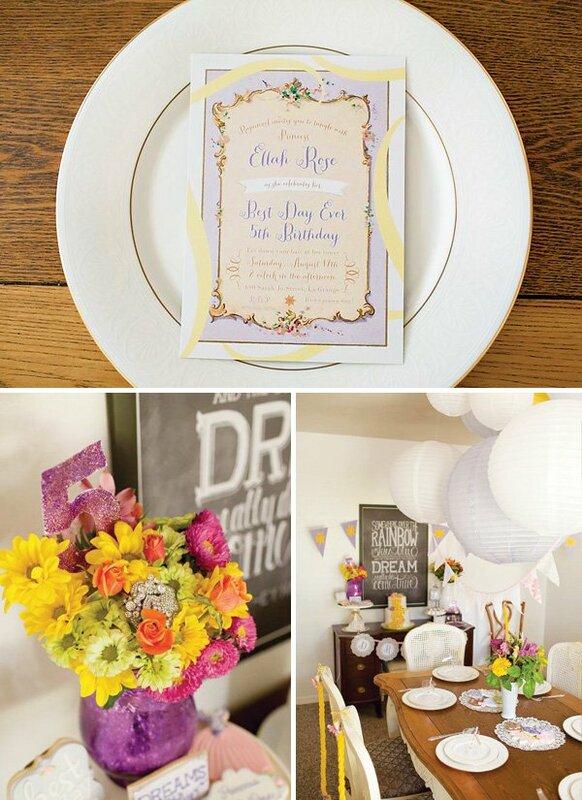 Even if you’ve never seen the SUPER CUTE Disney movie Tangled before, it will be hard not to fall in love with all the charming details in this beautiful Tangled Inspired Rapunzel Birthday Party from Jenifer Hill of Hello Love Designs! Jenifer’s daughter said she wanted to have the “best day ever” and I think we can all agree — mom delivered. 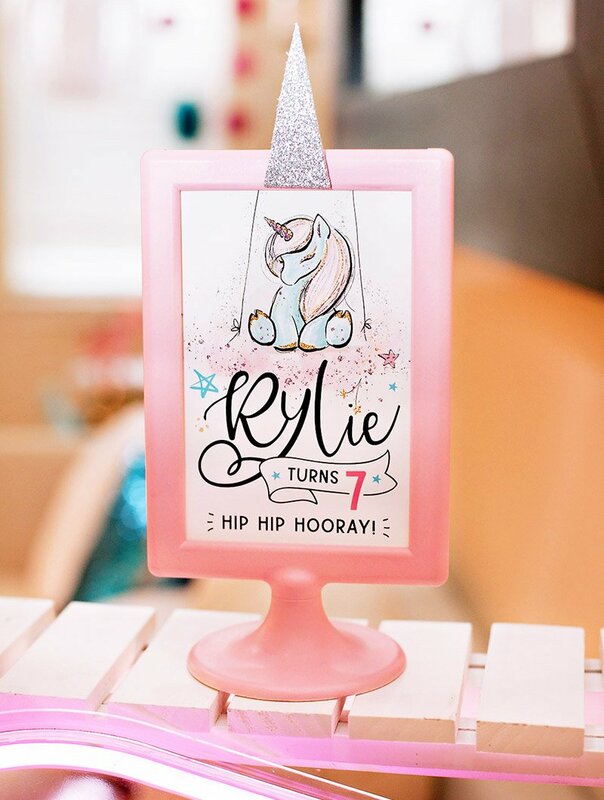 From Rapunzel braids adorning the back of every chair to gorgeous piped princess cookies and whimsical ‘Somewhere over the Rainbow’ chalk artwork, everything came together beautifully in this fairytale of a birthday party! My daughter’s favorite movie is Disney’s Tangled, so when she told me she wanted a “best day ever tangled party” for her 5th birthday, I was not surprised. As a designer, I love using character inspiration but not the actual characters themselves. My thoughts were, I wanted to throw her a Rapunzel princess party that she could relate to without using the characters. More importantly, I wanted to throw her a party that focused on the birthday girl and not the character. I finally decided to approach the party from the perspective of Rapunzel is throwing a birthday party for my daughter full of her favorite things. In all of the planning, an underlying theme developed: Dream. It was Rapunzel’s dream throughout the movie to see the floating lanterns, and my daughter is a natural dreamer. Her favorite song is “Somewhere over the rainbow…dreams really do come true.” So to encourage a dream at 5 years old was a magical fit. We welcomed the sweet party girls to walk down “Rapunzel’s Barefoot Path,” which was our pebbled sidewalk leading to the front door. Along the path they spotted Flynn Rider’s wanted poster tacked to a tree. This was the one and only exception to my no-character policy! Flynn had to make his appearance, Rapunzel insisted. As the girls arrived, they were escorted to our long driveway where they could create sidewalk chalk masterpieces just like Rapunzel did. I believe the most interesting masterpiece award went to the “Toaster Monster.” Ha! 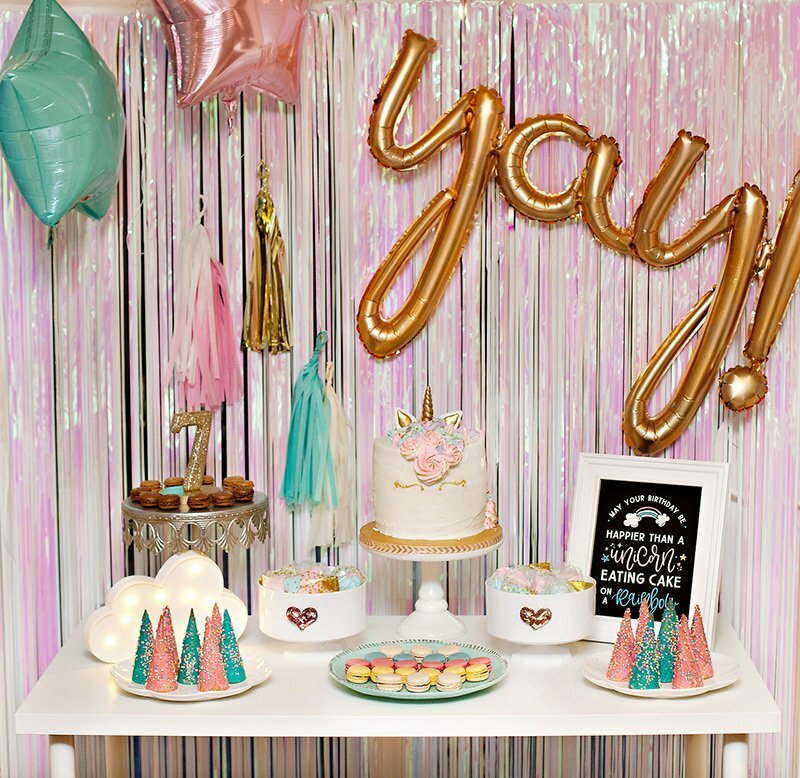 After all of the party guests had arrived, the girls were whisked away to the dreamy party room where the table was set and ready for Rapunzel’s Painting Class. 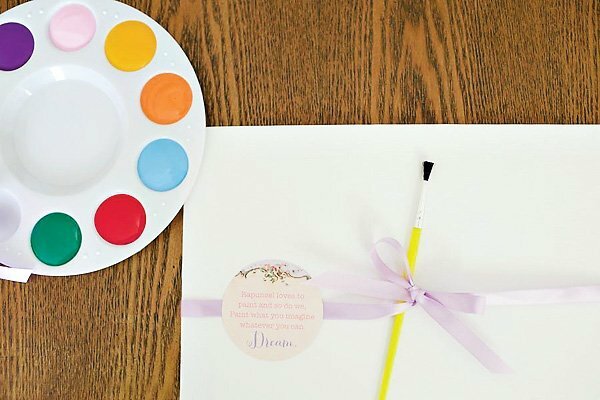 Each girl was given an 8×10″ canvas, brush, and painter’s palette. A message on their canvases read, “Rapunzel loves to paint and so do we, paint whatever you can imagine, whatever you can Dream.” The girls worked until their hearts content and the canvases were covered in bright paint. Paint class was dismissed, and the girls moved on to the Hunt for the Crown scavenger hunt — something my daughter requested. 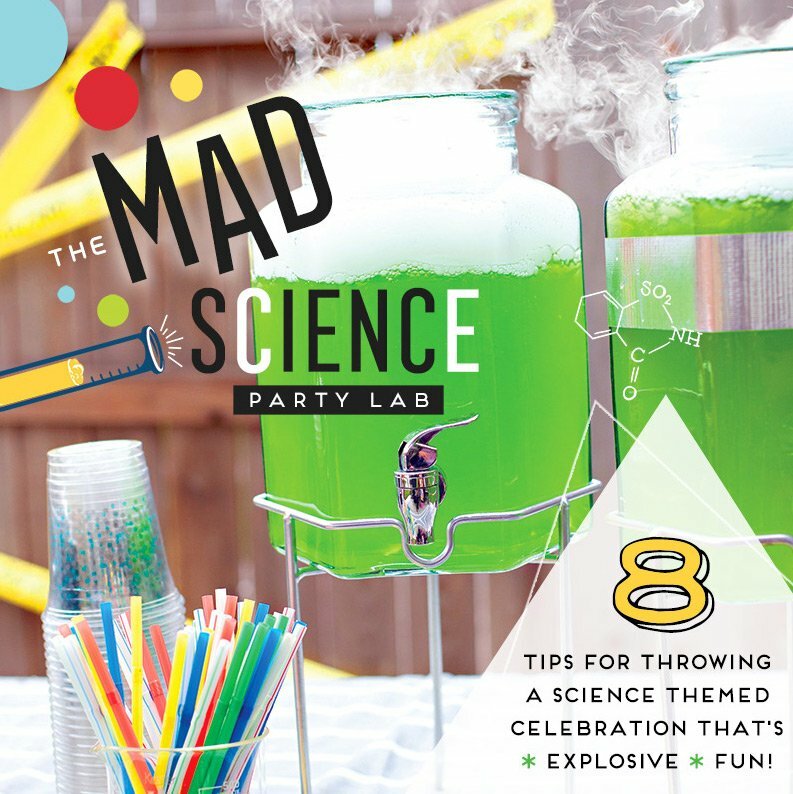 There were literal shrieks of excitement when we announced this activity. Several items were hidden outside with clues to the next object eventually leading them to Rapunzel’s crown where they all received a prize for finding the crown. My husband lead the hunt and read the clues to the girls. After the hunt, we settled back down into the party room where the girls were given handmade Rapunzel braids made out of yellow yarn to decorate. I purchased self-adhesive flowers and jewels which they used to stick on the hair. We clipped the adorned braid into their hair, and the girls danced around swinging their “long Rapunzel hair.” Later in the party, they also enjoyed Rapunzel and Pascal’s hide-n-seek. My dining room was turned into the dreamy royal party room. 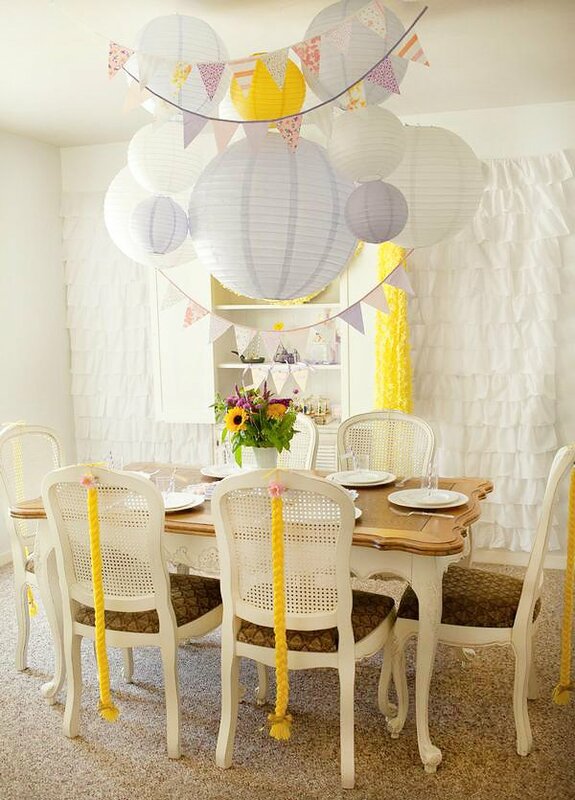 Rapunzel braids hung from the backs of the chairs while the table was simply set with the princess’ “royal” china. Of course, hanging above the table were Rapunzel’s favorite floating lanterns. 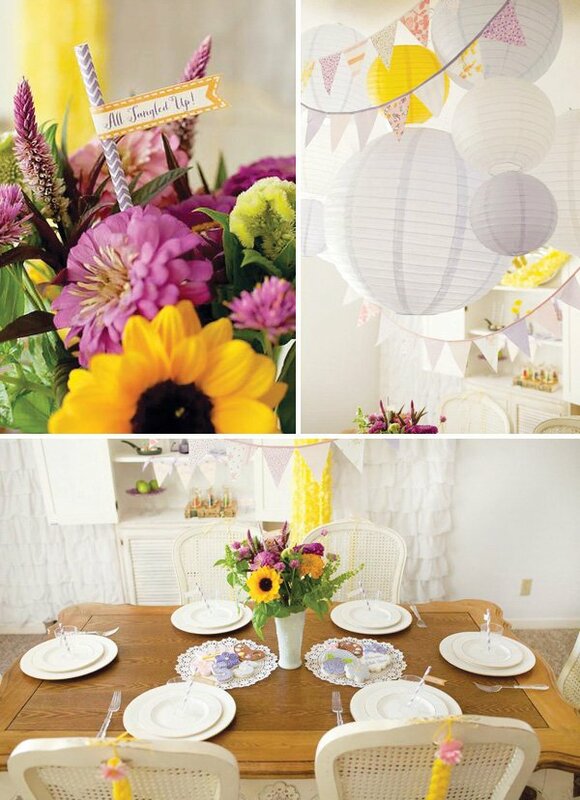 I purchased several sizes of lavender and white lanterns from Just Artifacts and the lilac blush vintage fabric bunting from A Fete Beckons to create a festive lantern display. I relocated a few pieces of our furniture. My daughter’s antique vanity was used for the sweets table. A distressed cabinet held Rapunzel’s long golden hair which was really yellow tissue festooning gathered together. 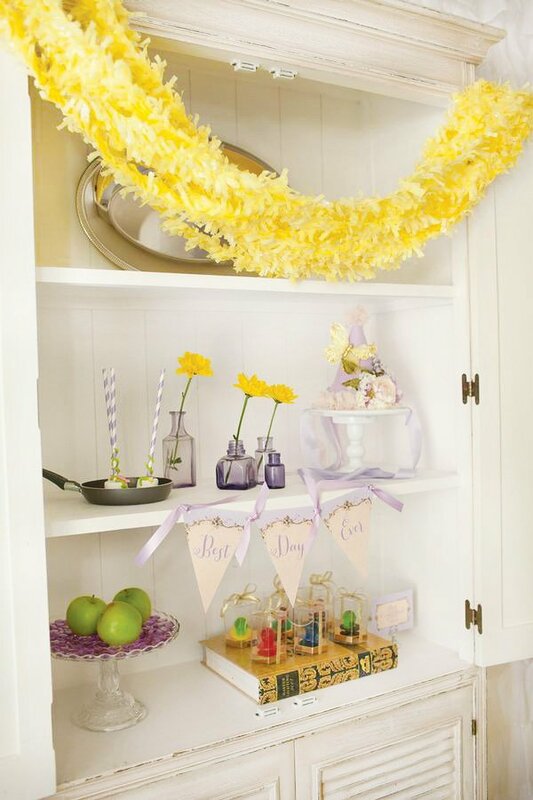 I also used the cabinet for the ring pop “Royal Crown Jewel” party favors and other Tangled treasures the girls loved spotting like Maximus’s green apples, the frying pan holding marshmallow pops, and the golden flowers inside vintage purple bottles. My personal favorite was the chalkboard artwork by Dear Lillie. I spotted the Somewhere Over the Rainbow print a while back and wanted to purchase it for my daughter’s room since that’s her favorite song. Her party gave me the perfect excuse to buy it. 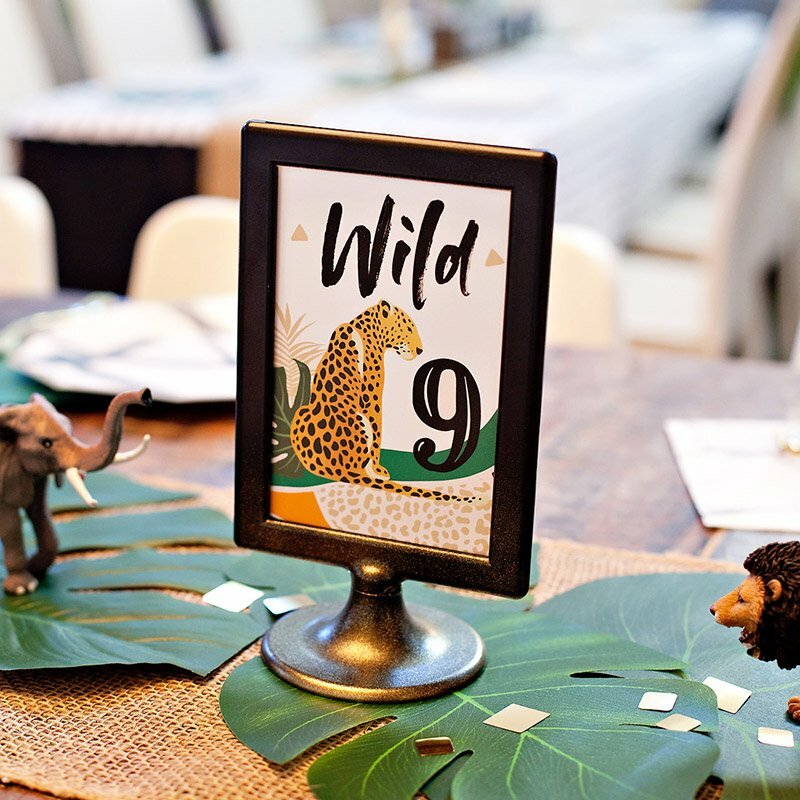 The chalkboard print was the centerpiece along with the cake. I created the royal banners and hung them to each side of the print. 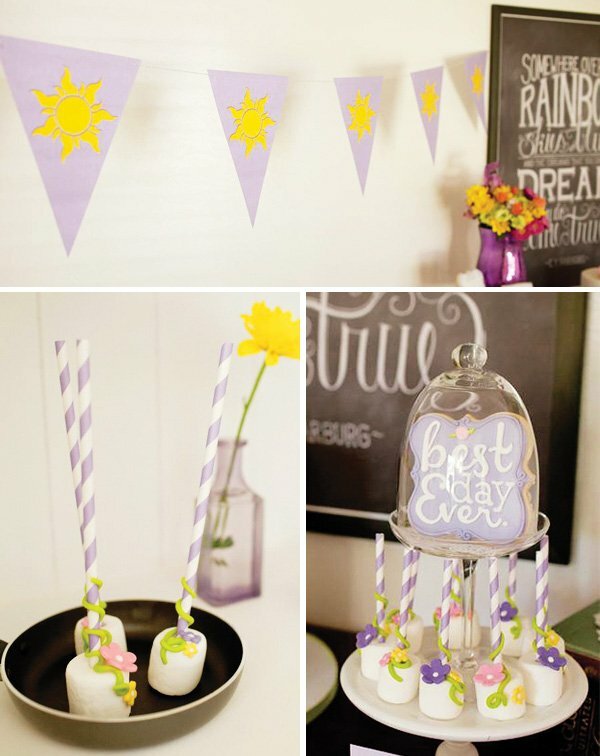 I also designed printable dessert labels and the “best day ever” banner seen on the cabinet. 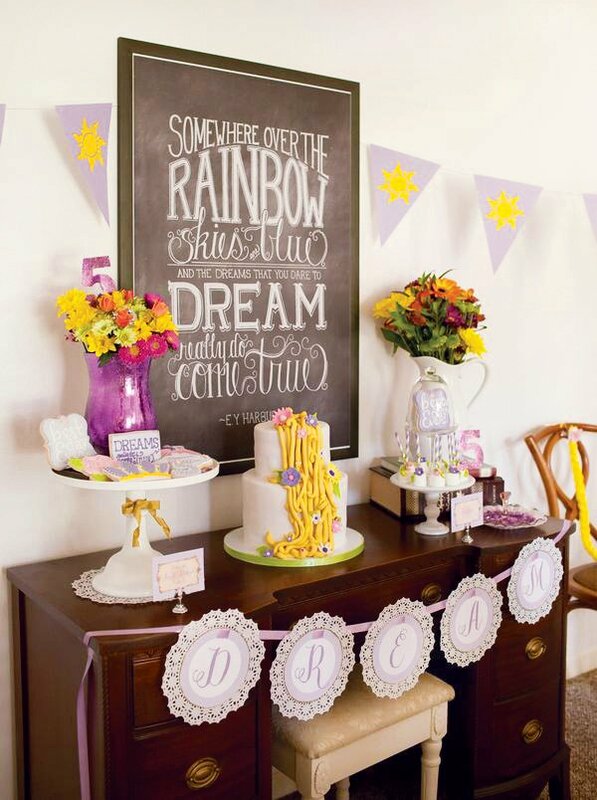 Of course a princess party would not be complete without flowers. Flowers were seen throughout the Tangled movie, not to mention my daughter loves flowers, so I picked up a few bouquets in my color scheme from the grocery store. I loved the dining table arrangement because the flowers were wild and had the large sunflower symbolizing the magic flower. I had Melissa with The Best Little Cake Shop in Texas make the cake and the Tangled marshmallow pops. 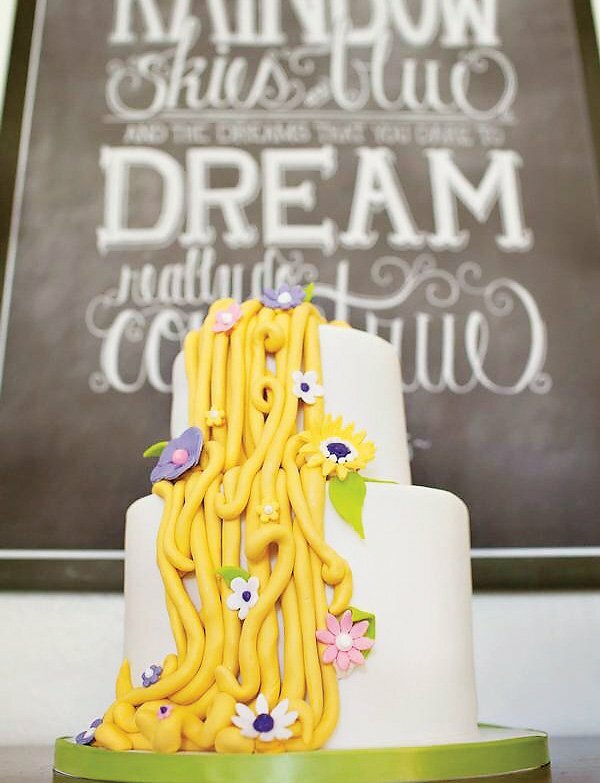 I adore wedding cakes with the gorgeous flowers flowing down the tiers, so I thought we could do the same thing with Rapunzel’s hair. Melissa even decorated the hair with flowers! The cake was truly amazing. My daughter prefers marshmallow pops over cake pops, so we included those. “tangled” tiny vines and flowers around the pops for the most delicate, girly sweet treat. Icings by Ang created stunning decorated cookies for the princesses. I was astounded by her artwork! 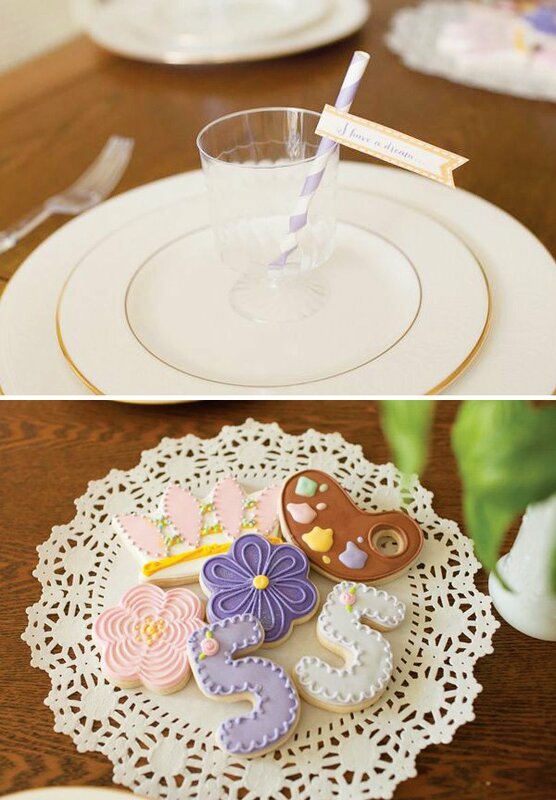 Of course, these cookies were freshly baked by Rapunzel herself (so the dessert label says!). 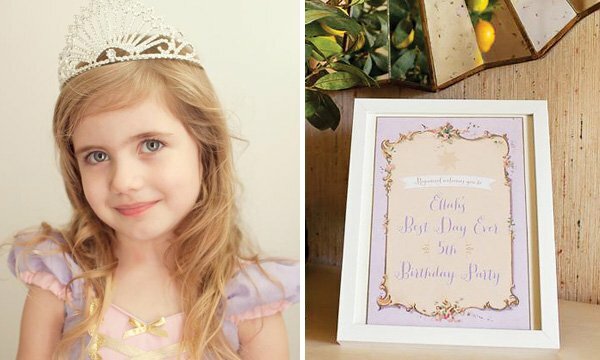 Her cookies included crowns, princess dresses, flowers, “best day ever,” “dreams really do come true,” a painter’s palette, the number 5, and personalized cookies with my daughter’s princess name, “Princess Ellah Rose.” Perfection. 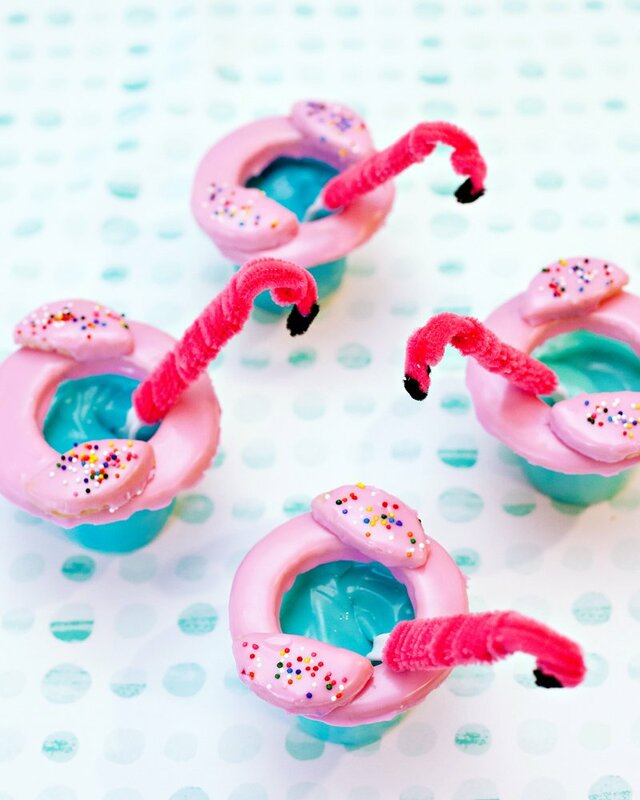 Another favorite treat were the hard candy jewels made by Candied Cakes. I ordered the lavender jewels for the color and they looked just as gorgeous as real amethysts! The candies were so pretty the girls thought they were real too. I used the jewels as a colorful base to display Maximus’s green apples. They were also free to grab from a dish on the cake table. The princesses loved the birthday girl’s signature drink “Princess Punch” which was sparkling apple grape juice. I searched high and low for the perfect 5 year old birthday princess dress. 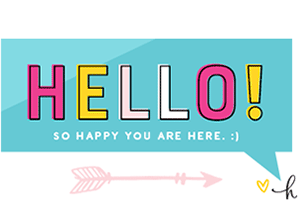 I remembered one of my favorite Etsy shops, Lover Dovers Clothing, and found exactly what I was looking for. The dress was beautiful, “made by Rapunzel,” and left my daughter speechless when we opened the package. I’d say perfect. 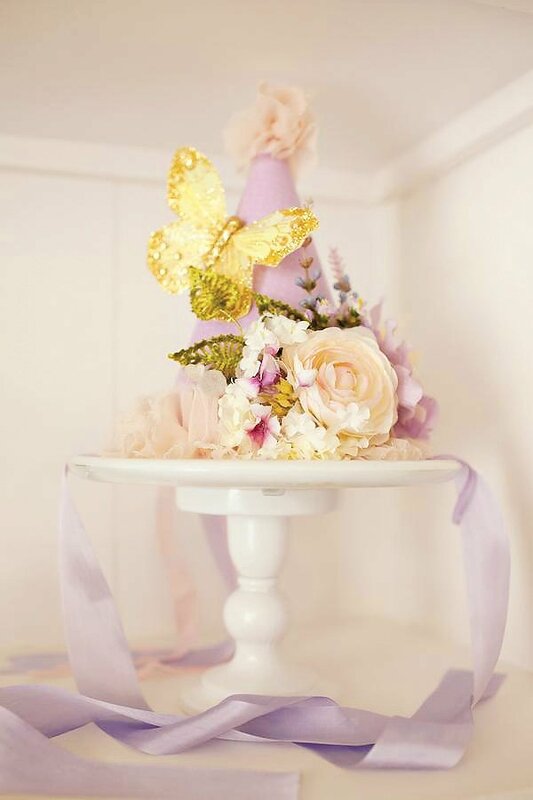 Her party hat was custom designed and created by Jessica of Prop Shop Boutique. Jessica took my ideas and inspiration and created the most gorgeous party hat I’ve seen. I was beyond words to see how beautiful and well made it was in person. Absolutely dreamy. The birthday girl did not wear shoes because, well, Rapunzel never wore shoes. 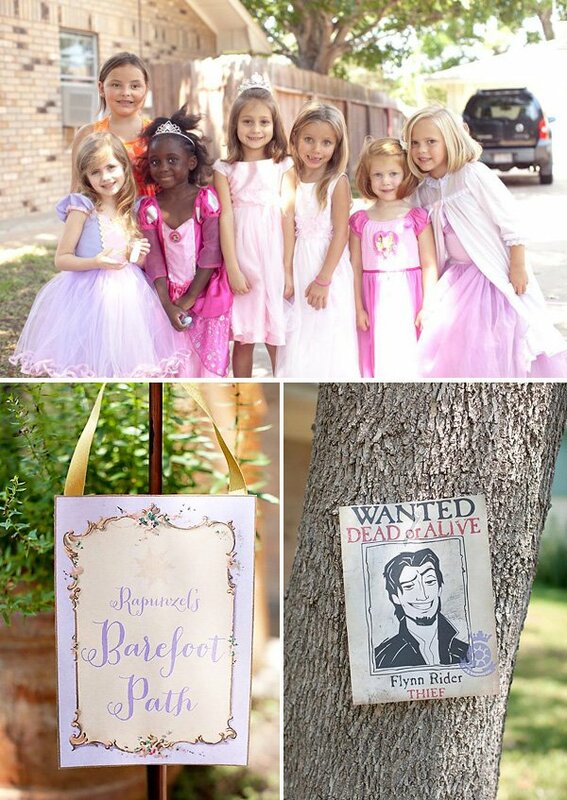 The princesses were sent home with plenty of party favors: a Rapunzel braid, artwork, a decorated cookie of their choice, mini painter’s palettes from Shop Sweet Lulu, lip gloss, ring pops in a box, and candy jewels. The bags had a favor sticker that “Thank you for making my birthday party the best day Ever.” For the birthday girl it truly was the best. day. ever.